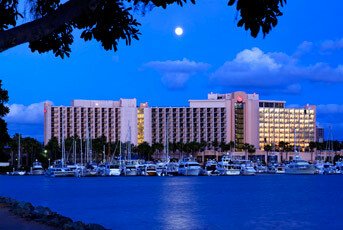 To book your room(s) at the Sheraton San Diego Hotel & Marina online, click here. You do not need to enter a group code as the form will pre-populate. To make your reservations by phone, call +1-877-734-2726 and request the Enterprise Data World (EDW) group rate at the Sheraton San Diego Hotel & Marina. Traditional rooms are sold out. Deluxe rooms are available for $229 and Club rooms are available for $259 until March 29 or when the block sells out, whichever comes first. If you have any difficulty booking a room at the Sheraton, please call us at +1-310-337-2616 x1 or email us, and we will do our best to help. Government Attendees: DATAVERSITY has contracted a very limited number of sleeping rooms at the government per-diem rate for US Federal and State of California government attendees only. Please contact us directly to reserve a government-rate room by calling +1-310-337-2616 x1 or emailing us. Attendees booked at the Sheraton San Diego under the EDW room block will have access to free internet in their sleeping rooms (normally at $10.00 USD for each 24-hour period). Please be aware: DATAVERSITY has been made aware that a service provider called Exhibition Housing Management has contacted a number of individuals to offer hotel reservation services. Exhibition Housing Management does not represent DATAVERSITY, nor have we authorized them to contact attendees on our behalf. What is happening: EHS contacts event attendees claiming to be an authorized booking agent or housing bureau, and either (a) offers to assist in securing hotel accomodations or (b) states that because the official event venue has been overbooked, EHS will locate alternate hotel accomodation (for an additional fee). NOTE: Event attendees should not share any personal information, including credit card information, with EHS. To be safe: To book your accomodations safely and securely for this event, please use this DATAVERSITY-authorized link or call the hotel directly at +1-877-734-2726. Enjoy complimentary shuttle transportation, which runs every half-hour between 4:45am - 12:00am, between the Marina and Bay Towers as well as the San Diego International Airport. Call 619-291-2900 to arrange your shuttle transportation. Complimentary Airport Shuttle: Shuttle runs every 20 minutes from the San Diego International Airport between the hours of 4:45am and 12am. Outside of these hours guests may request a pickup by phoning the hotel directly. Travel Distance: Approximately 7.0 miles. Travel Distance: Approximately 22.5 miles.